I love the end of the year. I get to reflect upon what I accomplished (and didn’t!) and look forward and dream about what the next year has in store for me. This year had some nice highlights for me. I tackled my knitting nemesis (a really great thing) and made my first (and definitely not last) knitted skirt. However, I didn’t get done nearly as much as I had hoped or would have liked. I have 11 FOs from this year and I feel a little unfulfilled because of it. It’s not just the fact that I only finished 11 things (although sure, I’d love to have a couple more hand knit sweaters in my closet and a drawer full of hand knit socks [very cool pic, you have to click]), but more so my reaction is that I didn’t finish many of the things I started. I’ve given this one a lot of thought. For 2008, I’m going to make a serious effort to finish things. I never would have finished St. Brigid had I not had the Rhinebeck deadline. Same goes for the wedding stole I just finished. Part of the cause of this not-finishing thing is that I have a tendency to start projects on a whim, and once I see it’s not doing what I want it to, I abandon it for the next thing. This goal has a second benefit too — stash management. My unwieldy stash is at least in part caused by the fact that I start so many projects. It’s hard for me to go back and use an “old” yarn. So, finishing things will make for a smaller stash (and a happier me). Knit 12 projects from books or magazines I haven’t knit from yet. Knit more socks. 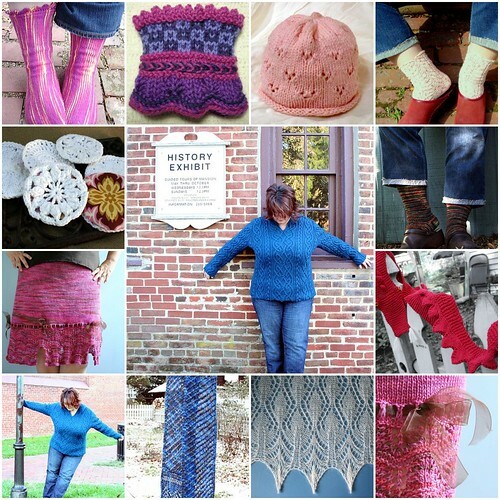 I knit 3 pairs last year (although if you count half-pairs I probably knit twice that amount). Let’s make 6 a goal for this year. Branch out more into mixed-media knitting. This could be a bag with a fabric lining, or a sleeve with some embroidery, or a top with some ribbon applique, or a small sewn quilt with a lace edging. I miss the other crafts so you’ll be seeing more of them in the coming year. I won’t just be knitting, although I’m sure I’ll be knitting more than anything else. End the year with less stash than I started. 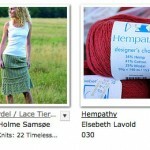 The book idea originated in a NJ knitters’ group forum on Ravelry, and is one I really love. Knitting books are beautiful, and having so many great books at my fingertips gives great inspiration, so I don’t often stop myself from buying a book. However, I want to knit more projects from them in the coming year. There are some really great patterns out there. While i’m not choosing which 12 things I’ll knit from my books in the coming year, I did put together a few possibilities. I already have yarn in my stash for many of these sweaters. A small confession — I’m secretly hoping to knit three sweaters next year. In reality, I should be able to do it if I stick to the finishing thing. But, for the past 4 years I’ve finished exactly 1 sweater per year, so three feels a little pipe-dreamy for me. And here’s a sampling of accessories I’d like to knit. There are also a few bags that have caught my attention. Can you believe I’ve never knit a bag? Two of the bags in the latest KnitScene are great! Pam Allen’s applique bag really speaks to my desire to mix media in the coming year too. Plus, who doesn’t like an excuse to go fabric shopping? In closing, I want to thank you all for the comments, advice, inspriation, support and encouragement. This community is an awesome resource and I’m thrilled to continue to be a part of it. I wish you all a wonderful 2008, filled with your favorite yarns, your best needles and your prettiest FOs! ps – I upgraded to MT 4 over the weekend. It’s going to take a bit of time before I have my templates updated, but for now this one gives a glimpse of what I plan for this blog in 2008. It made me excited to see your little wrister from our class together! 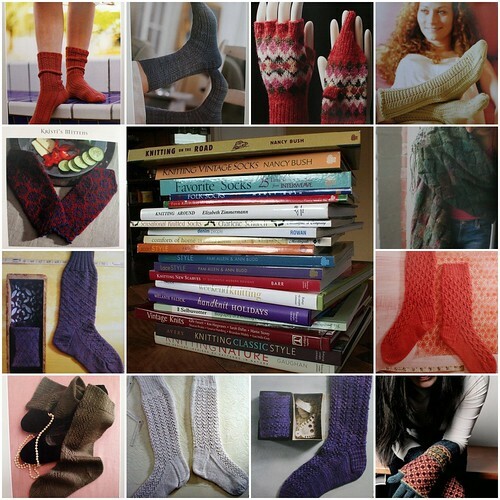 I love your idea to knit from previously unknit books. I, too, am trying to go back and knit some things I previously (and still) desire, and knit with yarns in the stash that I really truly love instead of constantly going back to the yarn shop. Have a happy new year, friend! Thanks for your roundup, which led to a present for myself: the pattern for your Unbiased Scarf. I’ve been wanting to make something like it — on the bias but not — and you gave me the answer. Happy new year (not only in knitting) and thanks again for your talent and inspiration. you had a great year! i’m sure 2008 will be even better! I love end of the year retrospectives. Although you only finished one sweater, what a WONDERFUL sweater it is!! I hope all your ’08 resolutions come to pass. Your post is full of good ideas and inspiration – I for one, will be copying your knit-from-books idea. Frogging less and mixing my medias are also goals of mine – I have dreams of my fabric and yarn mingling together. And that sweater? Definitely should count as two or three. Your blog looks beautiful, Jody! Beautiful collections of pictures! Happy New Year! I like your reflective posts It sounds like you have some great plans for 2008! I also like the new header for your blog. great goals! your dedication, organization, and creativity remain an inspiration to me. 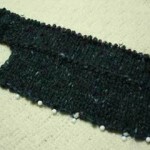 one of my craft resolutions is to be patient and knit the darn thing to the right size. if this means frogging or missing a deadline, then oh well! Beautiful mosaics of your creations – the crowning achievement being the sweater that you were able to finish! 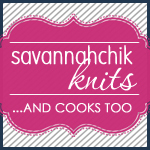 Your knits and your spirit are a great inspiration, and I look forward to another year of “knitting together” with you! love the recap, especially the book resolution. I have acquired so many books lately so that wouldn’t be such a bad idea!! Definitely a cute choice! I’m sure the parents will be thrilled. I like your goals for the year too. Wish I could help you on the sock mojo, but I’m pretty lacking in that myself right now. Hope to see you next week! I thought he book idea was so good, I’m swiping it myself – knit from what I have until I reach 14 FOs. Thanks for the inspiration. You had some incredible & inspiring FOs in 2007, you should be quite proud! I love your inspiration shots for next year as well – truly, there is so much beautiful stuff out there! I’d like to knit more from my books too, darn if the collection doesn’t keep on growing! Fabulous. I have lofty goals for 2008 also. I have a good start going. Perhaps we’ll end up doing Lady Eleanor at the same time. I also share your hope of having a drawerful of handknit socks. Wouldn’t that be fantastic?